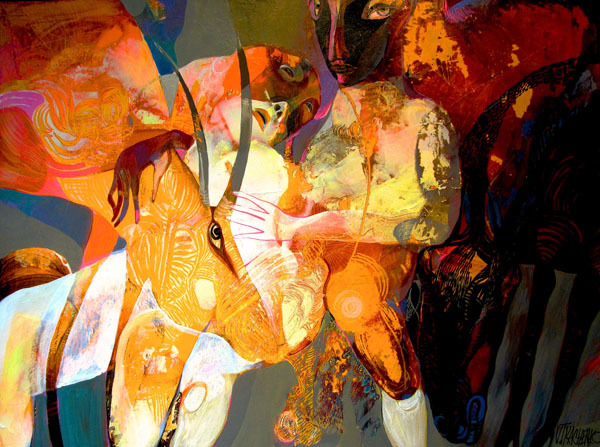 Victor Tkachenko, is a Ukrainian-Canadian artist living in Toronto, Canada. 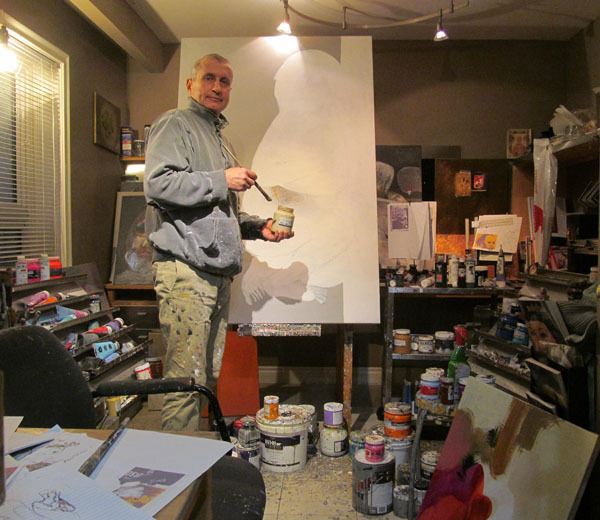 Victor received professional art training beginning at age ten and was one of a few graduates to complete the extensive and rigorous program from the renowned Art School in Krivoy Rog, Ukraine. Following his fine art education Victor gained architectural training (graduate level) at the Kyiv National University of Construction and Architecture in Kiev, Ukraine. As a painter Victor works primarily with acrylic on board. 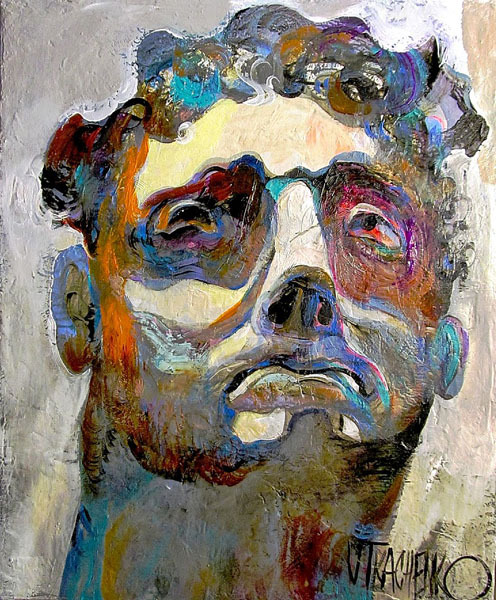 He displays a mastery of line and color through purposeful brushwork and a palette dominated by rich earth tones thickly applied to the canvas. 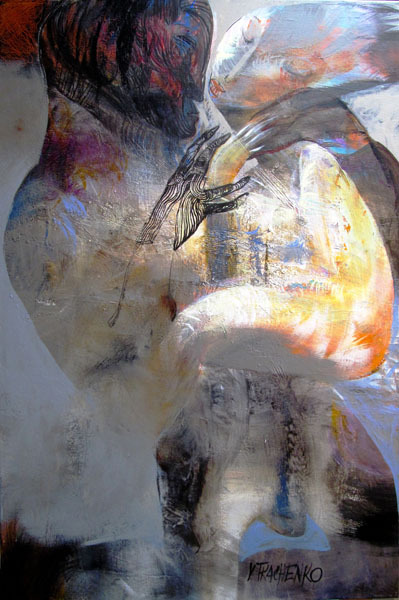 The physicality of his work is enhanced with accents of ink and, intermittently, the addition of industrial materials such as varnish and plaster. Throughout the various stages of his work, Victor’s figurative forms are drafted with elongated lines, exaggerated features and geometric patterns. Before age ten I was drawing constantly so my mother put me in art school. I drew cats, airplanes, flowers, tanks, horses, etc.! I was selected a year earlier than normal. This was a rigorous school with lessons a few times per week outside of regular school. Specialized art training: Krivoy Rog Art School (ages 10-17). This school was an art school for kids, a Union Art School for Workers and so on. All very intensive and separate from full-time studies. Also I continued to study art at the same time as my Bachelor Degree studies in Architecture from Kyiv National University of Construction and Architecture. I also completed some Post Graduate work in Architecture there as well. Everything! From street art to the Old Masters. Figurative mostly and sometimes still life, (nature motifs) and landscapes. My clients have come from all over the world, most recently the Middle East and a lot of clientele from the USA. I can never predict my “next series.” Recently I had a lot of fun creating the SHOWstudio Paris Fashion Week Haute Couture collections (noted above) – these collections were innovative, creative and crazy!! All of these designers served as an inspiration for me and the SHOWstudio curator was enamored with my work, and informed me that my fashion illustrations were her favorite from the 80+ illustrators invited to date since the start of this project. Which artists inspire you the most. These honestly keep changing as I continue to grow as an artist. But one genius is American artist John Singer Sargent (e.g., Portrait of Madame X).